The official South African currency is the Rand. The Rand is currently trading at 13.12 to the US dollar. There is considerable debate amongst South African economists on whether it is better to have a strong or weak currency. Some economists would argue it is better to have a stronger currency because it strengthens purchase power of the country and reduces trade deficits. South Africa imports a lot of goods so it would help if the Rand is strong. On the other hand, economists argue that a weaker Rand helps South African products with global competitive prices. No matter what side of the debate you fall on the Rand needs to find that sweet spot where it is beneficial to both imports and exports. 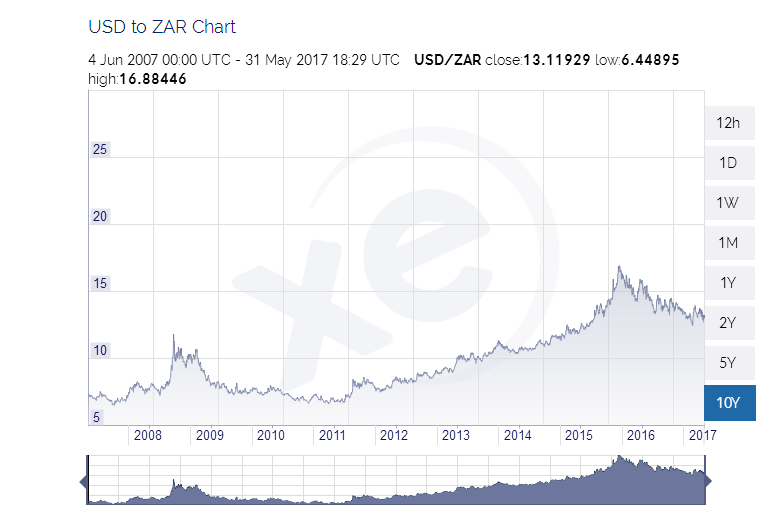 Looking at the graph above, we can see that over the past ten years the Rand has grown considerably weaker. Do you think a weak Rand is good or bad for the country?